At Capital Transport, we value our customers and want you to be rewarded. That’s why we have partnered with Qantas Business Rewards to reward eligible customers every time you use our services*. Earn 1 Qantas Point for your business for every $1 spent on courier and taxi truck services. Beyond earning on your transport needs, Qantas Business Rewards members can access a range of other exclusive benefits including earning on flights, everyday flight savings and the ability to earn Qantas Points on over 40 other everyday business expenses including technology, fuel, credit cards, office supplies and more**. Capital Transport customers can join Qantas Business Rewards for free, saving $89.50. If you are already a customer and satisfy the eligibility requirements*, you can earn Qantas Points by contacting your Account Manager. For more details about the program please visit Qantas Business Rewards. *A business must be a Qantas Business Rewards Member to earn Qantas Points for business. A one-off join fee of $89.50 including GST normally applies, however this will be waived for Capital Transport customers. Membership and Qantas Points are subject to Qantas Business Rewards Terms and Conditions. Members will earn 1 Qantas Point for every $1 paid (excluding GST) up to a maximum of 20,000 Qantas Points per month on conventional courier and taxi truck services provided to the Member under the Qantas Business Rewards transport rate structure by Capital Transport Services VIC, NSW, QLD, WA and SA. To be eligible under the offer a Member must have a monthly spend of no less than $100 (exclusive of GST and fuel surcharge), have a contract with Capital Transport, settle account in full within agreed trading terms and agree to trading terms of no more than 30 days from the date of invoice. Qantas Points for business are offered under the Capital Transport Terms and Conditions. Any claims in relation to Qantas Points under this offer must be made directly to Capital Transport by calling 13 14 80 or emailing qbr@capitaltransport.com.au. Qantas Points will be credited to the Members’ Business Rewards account within 40 days of purchase. **In order to transfer Qantas Points from a Qantas Business Rewards account to an individual’s Qantas Frequent Flyer account, the business account must have a balance of at least 3,000 Qantas Points. You must be a Qantas Frequent Flyer member to earn and redeem Qantas Points. A joining fee may apply. Membership and Qantas Points are subject to the Qantas Frequent Flyer program Terms and Conditions. We recommend you consult your accountant or tax adviser to ensure you understand possible tax implications, for example fringe benefits tax (if applicable). 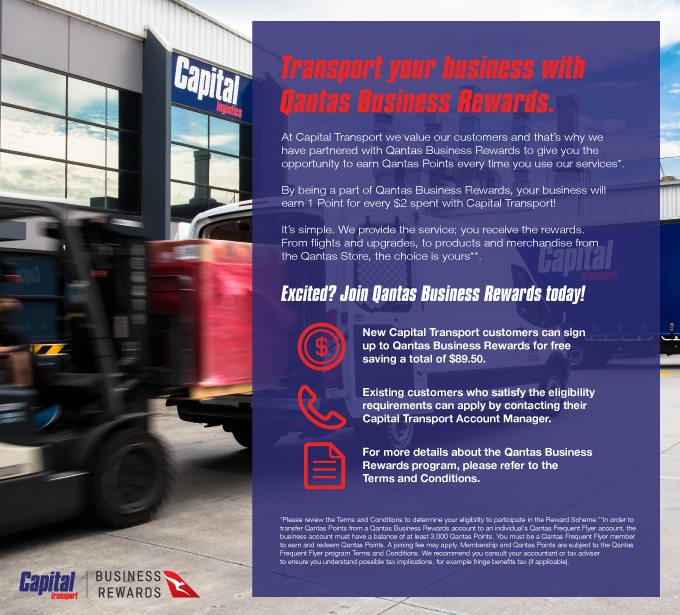 For Capital Transport’s Qantas Business Rewards Terms and Conditions, please click here.